Disney Avenue: What if Disney had built WESTCOT? 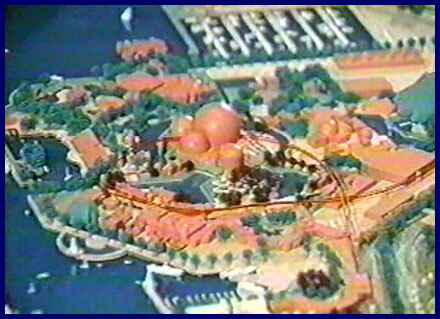 The park would have been divided into two sections similarly to EPCOT Center, Ventureport and World Showcase. 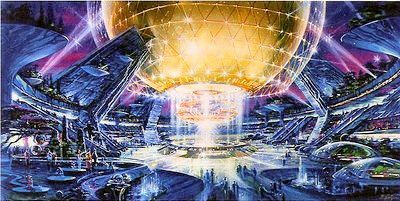 The original icon for WESTCOT would have been a 300-foot golden sphere, Spacestation Earth, surrounded by a latticework of metal. The sphere would have been set on a lush green island, which required crossing over a bridge and walking under a cascading waterfall, to enter. Spacestation Earth would have been home to a new attraction called Cosmic Journeys. 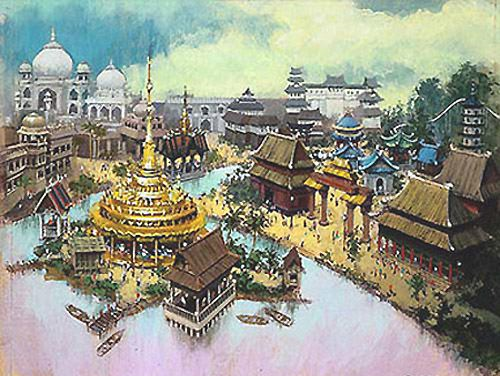 WESTCOT’s World Showcase would have been different than EPCOT’s. Instead of representing individual countries, WESTCOT would have grouped nations by regions. 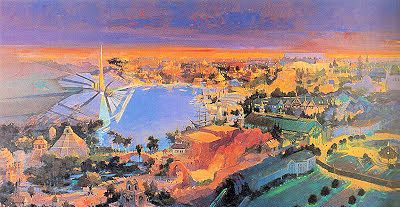 World Showcase would have been a representation of the four corners of the world. The four pavilions would have been The Americas, Europe, Asia, and Africa. The World Showcase area would have also been home to WESTCOT’s signature attraction, The River of Time. Perhaps the greatest innovation of WESTCOT Center would have been the ability to stay the night within the park. 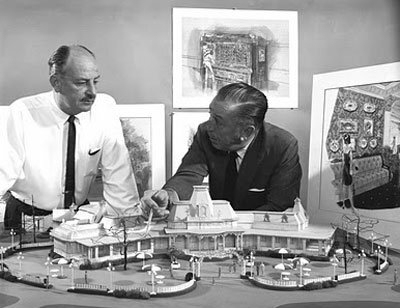 The Live the Dream Program, as it was referred to, would have been the first attempt at a hotel within a Disney Park, an idea that later became reality at Tokyo Disney Sea’s Hotel Miracosta. Disney Imagineers wanted to create a sense of isolation from the real world; therefore, the buildings of World Showcase would have been built as six-story structures. The first three floors would house attractions, retail shops, shows, and restaurants. The top three floors would feature hotel guest rooms. The World Showcase area would have been cloned, though countries would have been grouped by regions rather than individual nations. The first pavilion that guests would see upon entering WESTCOT’S World Showcase would have been the Americas Pavilion, with an area representing early 20th century United States at the park's entrance. The theme of Main Street U.S.A. at Disneyland would be continued, as the parks’ gateways would have been facing each other across a central plaza. The American Adventure in EPCOT Center would have been cloned and updated. A Native American Spirit Lodge show would have been shown in the Canadian section, and an indoor Mexican area which would have included a fiesta show and restaurant. There would have been another spirit show, featuring the Inca and Aztec cultures. One of the centerpiece attractions would have been the World Cruise, which was intended to be a boat cruise around the World Showcase. Audio animatronics scenes would depict many of the events shown, including Leonardo da Vinci working on the Mona Lisa, the burning of Rome, and Michelangelo painting the Sistine Chapel. After the show's conclusion, guests would have been able to board the next boat to continue the cruise or explore the rest of the area on foot. A clone of the attraction The Timekeeper was planned to be built in the European section. In Asia, Ride the Dragon, a steel roller coaster running through the Dragon’s Teeth Mountains would have had cars designed like Chinese lion-dragons seen in festival dances. At the point where the coaster would be at its peak height, enabling riders to see out of the park, the moving cars would be engulfed in billowing red and gold silks to hide the outside world. For smaller children there would be a carousel in this area of mythical Asian animals. Architecturally, the Asian Corner would have been composed of Japanese and Chinese elements and a white marble Indian palace which was to house the dining and entertainment sections of this particular Corner of the World. The Africa Corner would feature a white water river raft ride down the fictional Congobezi River, as well as an exhibit on basic farming culture. There would have been outdoor entertainment in the form of African drummers. There were also designs to build a grand Egyptian Palace; the latter was planned for the park’s first expansion. 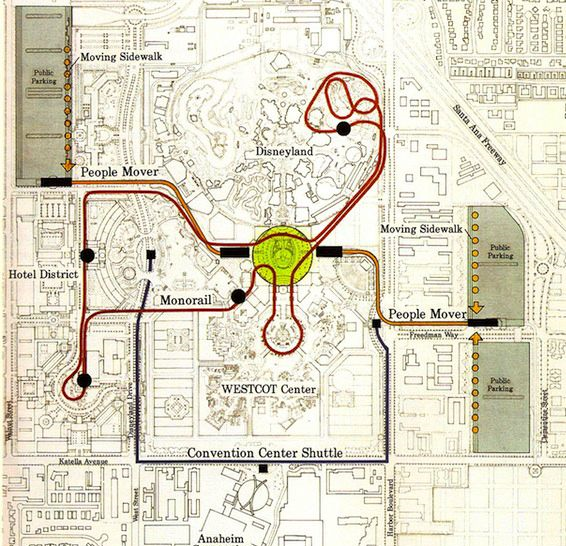 A shuttle system was planned to transport guests from the parking lot to the center of WESTCOT, which would have been dubbed the "Center Court." In Ventureport, a 300-foot replica of the 180-foot Spaceship Earth from EPCOT Center, named SpaceStation Earth, would have been built, though plans were eventually changed for a giant white spire to be at the center of Ventureport. An attraction similar to Adventure Thru Inner Space would have been cloned to WESTCOT as Cosmic Journeys. 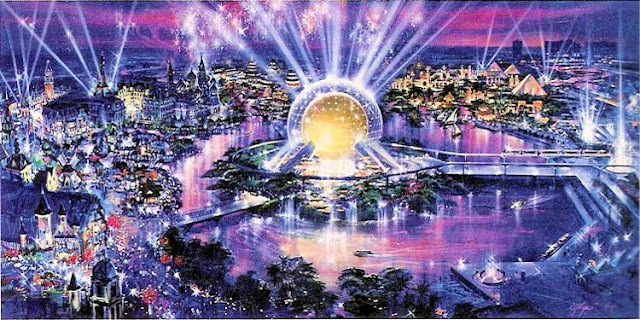 Improved clones of EPCOT Center attractions were also planned for this Future World type area, including Horizons, Journey Into Imagination, The Living Seas, Wonders of Life, and The Land. Next up, is a Los Angeles Times article from May 9th, 1991 detailing the plains for not only WESTCOT but the entire Disneyland Resort. At the time, Disney was contemplating the WESTCOT project to be built in either Anaheim or Long Beach. This project, in my opinion, would have been amazing! I have also included photos throughout the article for you to get a better idea what the whole project would have looked like. 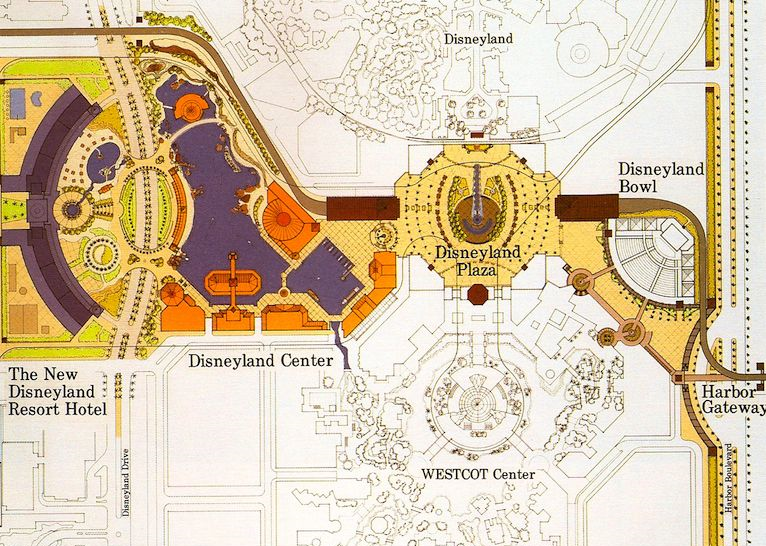 Plan Unveiled for Huge Disneyland Expansion : Parks: WESTCOT Center would adjoin existing site. But company says Long Beach is still in the running. ANAHEIM — Ending nearly a year of speculation, Walt Disney Co. unveiled plans Wednesday for a $3-billion expansion at Disneyland that would include a second theme park patterned after its highly successful EPCOT Center in Florida. 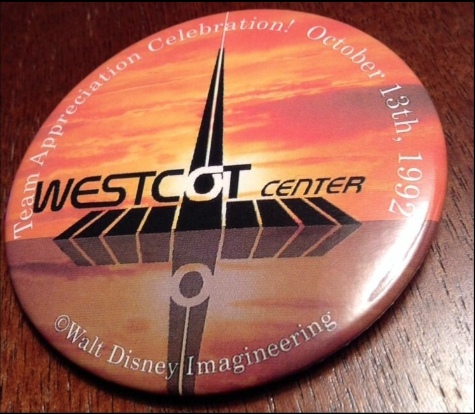 A highlight of the expansion, to be called WESTCOT Center, would be a giant golden sphere called Spacestation Earth that probably would join the Matterhorn as Disneyland’s best-known landmark. Also proposed for the 470-acre Disneyland Resort are three new hotels, a seven-acre public plaza and a collection of retail, dining and entertainment facilities called Disneyland Center to be built around a six-acre lake. 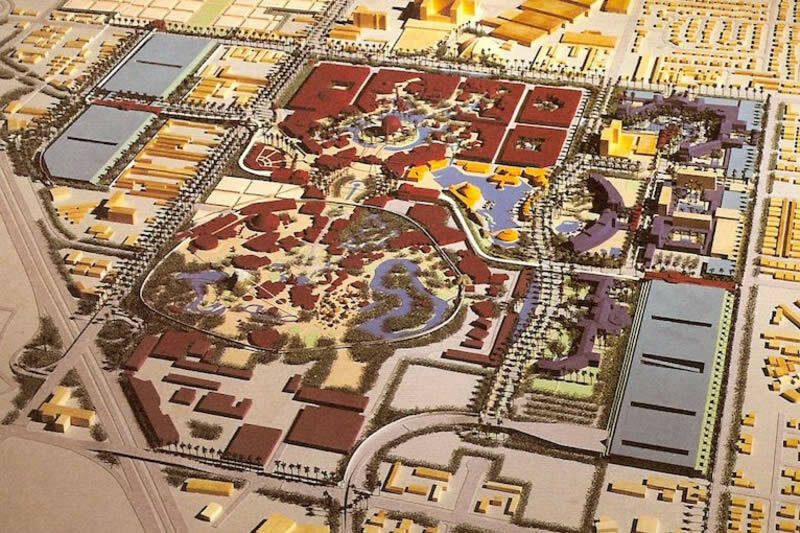 But even as they described the Anaheim plan in a series of briefings for reporters before a formal announcement of the proposal today, Disney officials emphasized that a decision on whether to build the company’s second Southern California attraction in Anaheim or in Long Beach will not be made until the end of the year. Even if the company chooses Anaheim, the plans would have to undergo extensive review, and the park would not be completed until at least 1998. Anaheim Mayor Fred Hunter, while praising Disney’s plans as “impressive and ambitious,” said “we need to know more.” He said the toughest part of the project lies ahead with what are expected to be protracted negotiations over how much the city would have to contribute in the way of transportation improvements and further land acquisitions. A key measure of local government commitment in Anaheim is expected to be revealed when planners try to implement a proposed transportation plan that includes three new multistory parking structures near opposite ends of the park–one on the northwest side near Ball Road and a pair of others on the east side near the Melodyland Church. Also planned is an expanded monorail system and an elevated people-mover system that Disney says would “significantly reduce” traffic near the park. The systems are designed to shuttle up to 8,000 tourists an hour from parking structures and hotels to the resort during peak times. Also included in the transportation proposal are plans for new off-ramps from Interstate 5 that would directly feed the project’s parking structures. What has not been decided is who would pay for the company’s costly transportation improvements, and Disney officials said they would seek public assistance in financing the projects. 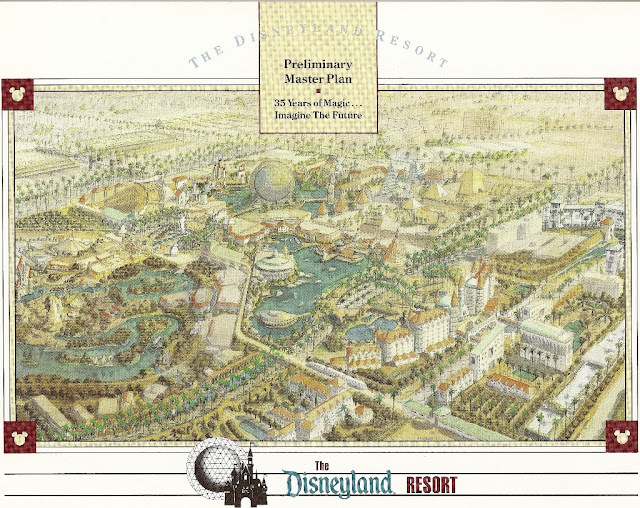 Although the inspiration for the Anaheim project was drawn from the company’s EPCOT Center, Disney Development Co. Vice President Kerry Hunnewell said the Anaheim proposal, because of space limitations and its urban setting, presents significant challenges for company planners. Still, Disney officials estimate that the project would attract 13 million new visitors each year. Late last year, the company quietly began acquiring tracts of land on the perimeter of Disneyland, aimed at paving the way for the company’s planned hotel district on what is now West Street, on the park’s western boundary. Included in those acquisitions were several low-rise motels where purchase prices were estimated in the tens of thousands of dollars per room. Plans call for West Street–between Katella Avenue and Ball Road–to be renamed Disneyland Drive and become a gently curving, tree-lined boulevard and home to the addition’s three new hotels. 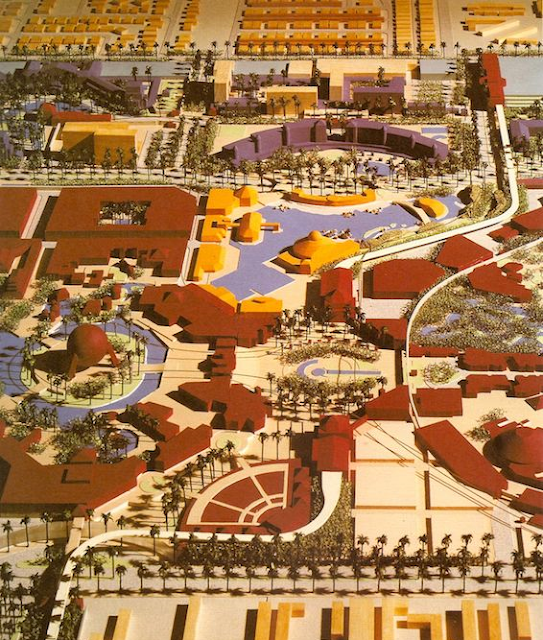 On the boulevard, the park’s main thoroughfare, Hunnewell said, architects would borrow themes from California’s structural landmarks, such as the Hotel del Coronado in San Diego, to construct the New Disneyland Resort Hotel, an 800-room luxury facility that would be the focal point of the district. On the same boulevard, plans call for an extensive renovation of the existing Disneyland Hotel to include a 300-room tower. North of the Disneyland Hotel, architects are proposing the Magic Kingdom Hotel, a 960-room low-rise structure to reflect the Spanish influence of the Santa Barbara Mission. On the other side of the Disneyland Hotel, there are plans for what is being called the WESTCOT Lake Resort, a 1,800-room hotel encircling the project’s six-acre lake and lined by palm trees. Pedestrian bridges would connect the hotel to a monorail station at the water’s edge. 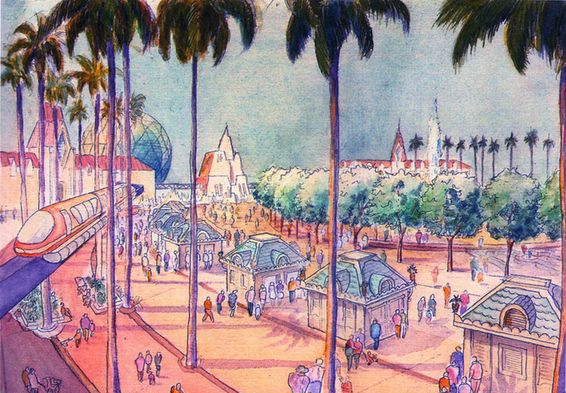 The network of monorails and planned people-mover systems would be designed to carry tourists to the seven-acre, open-air Disneyland Plaza, described by company executives as the resort’s hub, where visitors could enter the gates separating Disneyland from the WESTCOT addition. Lindquist said that visitors would be charged separate admissions but that costs have not been determined. Another proposed feature of the resort is a planned 5,000-seat amphitheater called the Disneyland Bowl. To be located between the main plaza and the Harbor Boulevard entrance to the park, the facility would be used for live entertainment events. Probably the most ambitious attraction–Spacestation Earth–would be spread over what is now the Disneyland parking lot. Beneath the Spacestation, visitors would be able to explore the wonders of nature in Ventureport. The attraction is planned as a “futuristic gateway” to pavilions dedicated to space exploration, biology, contemporary living and the environment. Disney’s selection of WESTCOT–a theme that echoes the nearly decade-old EPCOT–was no surprise to entertainment industry analysts, some of whom predicted months ago that the company would not stray far from its successes of the past. The only downside to the Anaheim development, Thorp said, was the limited amount of space. The current Disneyland site is spread over about 80 acres, while plans for the WESTCOT addition call for up to 100 acres of theme entertainment, more than 100 acres for hotels and dozens of acres reserved for parking. The company now has only about 100 acres and is negotiating for more. “Because of the limited acreage, everything would have to be much more compact,” he said. By comparison, Euro Disneyland, under construction near Paris, is about 5,000 acres; Disney World in Florida is 28,000 acres. The company is eyeing a 360-acre site in Long Beach near the Queen Mary, but a substantial amount is under water and would have to be filled. Thorp said the scope of Disney’s plans in Anaheim might accomplish what company executives are aiming for: a tourist destination with the potential to keep visitors at the resort for up to a week. Company officials say visitors usually remain at Disneyland only one or two days. “This would strengthen Anaheim’s drawing for people who wouldn’t otherwise plan to make a trip to Disneyland,” Thorp said. From a business standpoint, analysts say, directly linked theme parks could amount to the closest approximation to Disney’s successful formula in Florida. There guests stay for up to a week–often without leaving Disney property–spending millions at company-owned parks, hotels, restaurants, golf courses and shops. Several issues arose that would ultimately lead to the project's cancellation. 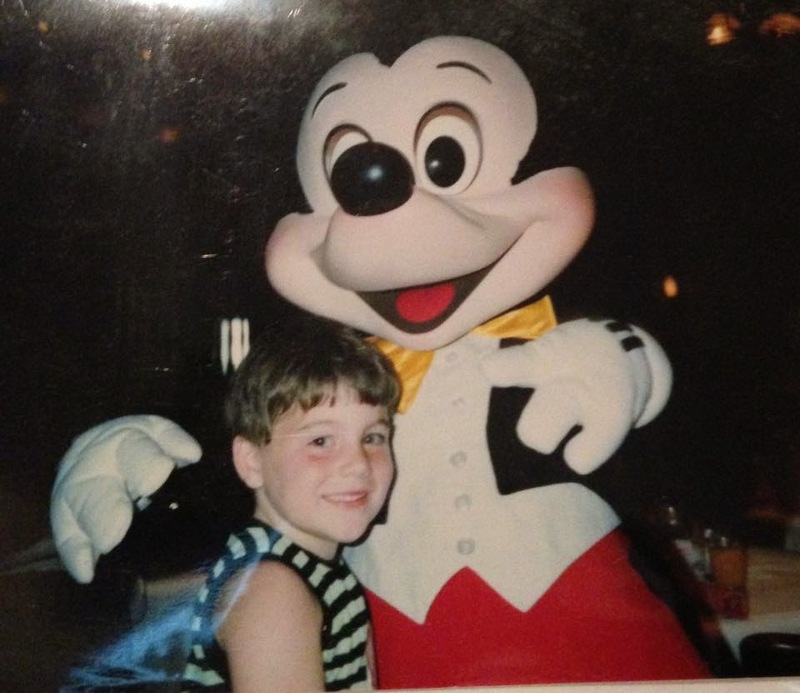 It required a significant land acquisition, though residential areas built around Disneyland caused land prices to skyrocket, and thousands of residents would have needed to be relocated. Residents claimed that the park's light pollution would be too much to bear at night, and that the replica of Spaceship Earth would have become an eyesore. With estimates hovering close to $3 billion and the company's significant financial problems with the recently-opened Disneyland Resort Paris, the project was scrapped in 1995. Then CEO, Michael Eisner held a three-day executive retreat in Aspen, Colorado to come up with a new idea, and from that meeting of about thirty executives came the idea for a California-themed park. That project became Disney's California Adventure, which opened in 2001 on the property that WESTCOT was to occupy. 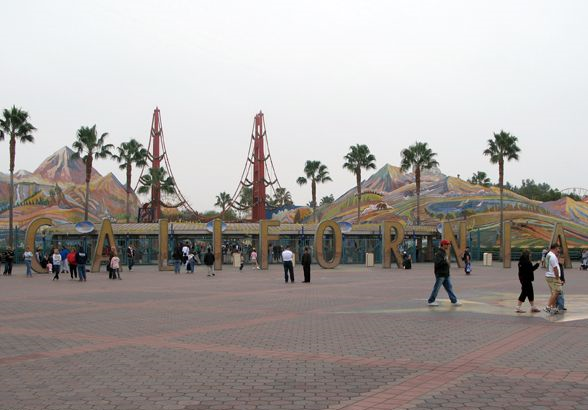 While Disney's California Adventure initially cost $650 million to build, problems with attendance and interest led Disney to spend an additional $1.1 billion to overhaul the park from 2007–2012, in addition to $100 million already spent on changes since its initial opening. 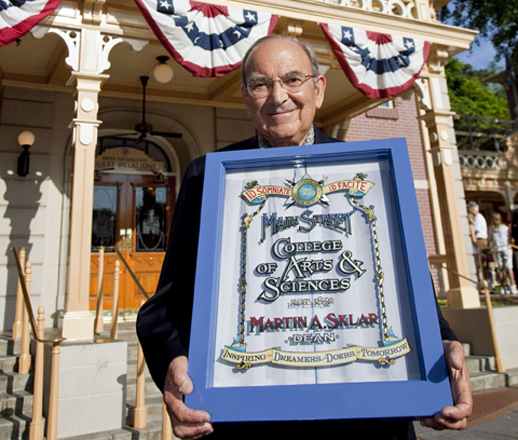 Defending the decision to proceed with Disney’s California Adventure, long time Imagineering Legend Marty Sklar once said, “I prefer not to spend six to seven years of my life on something that’s already been done.” Sharing Walt’s dislike for sequels, he also felt that WESTCOT Center was conceptually cumbersome. Sklar thought a park based on California had a great deal of merit. “You come to California and you can’t find it. You know what Hollywood Boulevard is like now and you can’t get into most of the studios. The whole Walt Disney story of coming out from Kansas City as a 21-year old, that’s a real California success story. 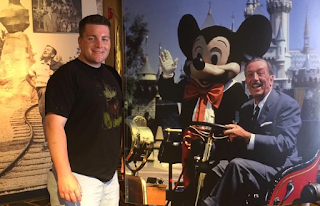 All of these things add up to something larger in people’s minds than what actually exists here.” Marty's vision for such a park eventually came to fruition in 2012 when DCA reopened as a parked modeled after California of Walt's time. WESTCOT and the original Disneyland Resort plan was truly spectacular in every sense if the word. It sought to turn Disneyland and the old, outdated, eye sores of motels and fast food resteraunts that surrounded the park into something extraordinary: a lushly gardened, brightly lit urban entertainment center. Had this project gone forward as originally planned, Anaheim could have emerged as one of California's premier destination resorts. The WESTCOT project seemed to have everything going for it. It had looks. It had style. It had the potential to make massive amounts of money, which executives like, and the scope and detail to make Disney lovers like us drool over.